Artificial nails are great for people who have problems with biting their nails, or want a more professional look. However, acrylic artificial nails tend to yellow when they are exposed to UV rays. Therefore, they need to be protected in the sun or tanning bed. Acrylic nails can be protected from the UV rays by covering them physically, or by coating them with a UV protectant. 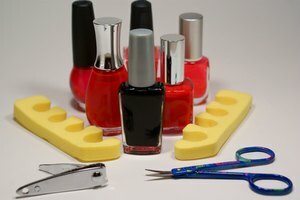 There are also alternative materials to create artificial nails, called Solar Nails, that are not affected by UV rays. Coat your nails with a UV protective nail polish. Painting several coats of the polish on the nails before exposing them to the UV light may help keep them from yellowing a great deal. Cover the artificial nails with nail savers or plastic bandages. Nail savers are little pockets that slip over the fingertips and cover the nail and the end of the finger from the UV rays. Bandages simply wrap around the end of each finger to protect the nails from the rays. Hang your hands out of the edges of the tanning bed. This method will not work if you are using a stand-up tanning bed. Opt for solar nails rather than acrylic nails if you are getting fake nails. They do not need any additional treatment to help them keep their original color.